Cover- Quite a fitting considering this issue was touted as a big breakaway between Samuel and Steve. Acuna frames the modern versions of each hero walking away from each other while their golden age selves smiles rather stupidly in the background. The American flag colors Red, White and Blue also jump off the cover due to the contrast with the black and white background. Daniel Acuna’s art is on point and at home here with Samuel Wilson. The interiors are on point. Everything looks great! Nick Spencer has taken a page from Al Ewing with how awesome he’s portraying Sam Wilson’s telepathic link to birds. Spencer uses it for surveillance and just straight up comedy. This is one of my favourite new releases because of how much of a conversation piece it can be. 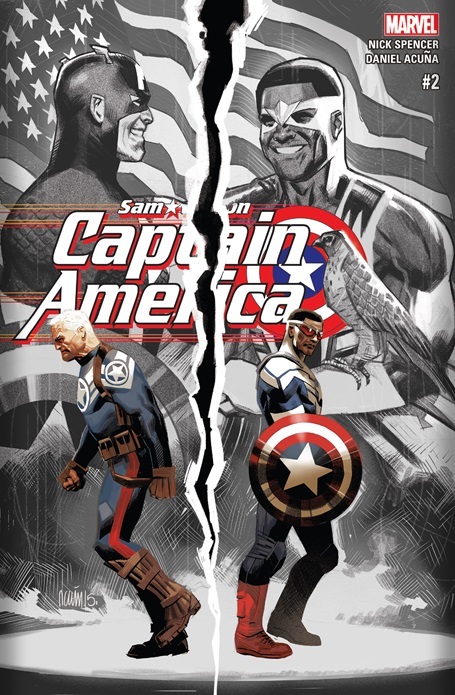 This story showed a maturing Samuel Wilson in the mantle of Captain America. He’s not with SHIELD or his mentor which is a good thing because it’s that difference that makes Sam so interesting to read. The divide is illustrated very well with the line in the sand being that Samuel as a black man in America can only hope his country and government will do right thing while Steve…ever the idealist believes that his country will do the right thing. This is a thought echoed all across my facebook feed as we see many African Americans victimized and brutalized by the agents of the government aka the Police. This book is deliciously political as all hell with Spencer having his characters voice modern day American concerns with Sam as the focal point. ← New NIGHTHAWK series announced by Marvel Comics!? I really did like the idea of an Edward Snowden /wiki leaks type character revealing that S H I E L D was secretly putting together A cosmic Cube was nicely topical and I thought Maria Hill’s denial / justification of the project sounded wonderfully authentic . I thought the exchange between Steve and Samuel regarding the “Whisperer ” having to stand trial was pitch perfect . But I must say I thought the story pulled it punches a little bit when Samuel , in response to Steve’s ( rather desperate – I thought ) assertion that he” had”to believe that the Whisperer will receive a fair hearing ( and there by addresses the larger point that his country will do the right thing when push comes to shove ), responds( grimly) that he” hopes “it will . I said it before and I’ll say it again JJ,you should be writing reviews on the website! It’s about time!